Hi, my name is Nathan, I want to tell you about my exciting New Product, Care Kleen (CareKleen Colon and Intestinal Cleanse) After the diet pill craze Crashed and Ephedra was outlawed, there was No really, really good Herbal Diet Pills on the market, it took a year and a half to come up with a Energy and Weight Loss Product that worked even marginally close. But our new Herbal Energy Plus FX filled most of the bill, providing Nice, Clean, Pure Energy. Over the next 3 1/2 years, I worked on my New Product and wanted it to be World Class and able to be combined with the Herbal Energy Plus FX. Which is the most potent Energy Allowed By Law. Well Here It is with Great Pride that I Introduce to you and Bring to the Market, Care Kleen. 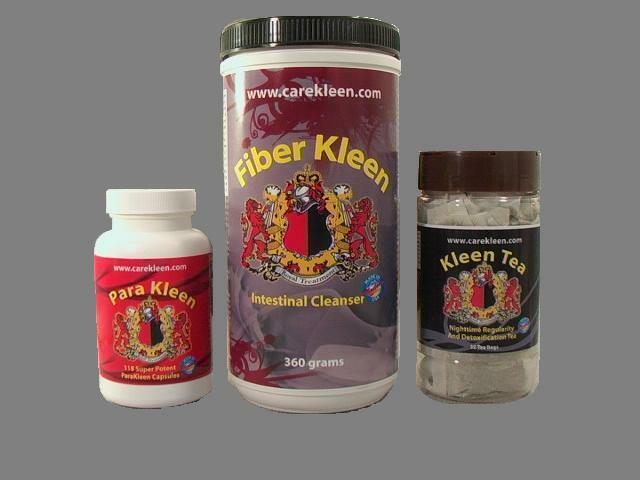 (CareKleen Colon and Intestinal Cleanse) is a 3 stage system that is formulated to program for 3 months and 3 more months of Care Kleen (CareKleen Colon and Intestinal Cleanse), stand alone or with the Chemicals and Toxins are Everywhere in this New Millennium. Everything from the Air to our Food and Water Supply is contaminated. If you live in the city, this is many times more Toxic to our bodies. Let’s face it our menu is not exactly healthy. From Fast Food to Junk Food, Candy, and Refined Sugar. The average Burger, Fries, and Drink at "Fast Food Giants" Not only Gouges your pocket, it's Killing us. Over 85% of Fat and 69% of Carbs in 1 Meal... WOW, and Dietary Fiber is Basically Non Existent single digits (2%-7%). Refined Foods and Sugar fill most of some folks Diet. Being Over Weight, having No Energy, and Feeling Just Burnt has become just the Norm. Doctors hand out pills like a Vender selling Hot Dogs. Shrinks and Doctors tell people they will have to take Anti-Depressants, for the rest of their lives. Pharmaceutical Drugs may help some. But, will play a Big roll in Building up Toxins, as well as Smoking, Illicit Drugs, Poor Diet, and Nutrition. Will all lead to Poor Digestion, and Toxic Colon Build up. You can get so Plugged up its Ridiculous. I hear people say they poop once a week or 2 times a week, and I'm like Oh My God!!! That is NOT Healthy. And it doesn't just get better all of a sudden. We have to do something about it. Care Kleen provides exactly what you need to kick cleaning this gunk out of you into high gear so your body can get the nutrients and vitamins out of the food you eat. If your car was that plugged up you would be Stuck in Traffic on the Interstate, Going Nowhere. Imagine how Bloated and Constipated you could be. The normal is 3-12 lbs of waste in everyone. Now this is the same average they also say it’s normal to poop 2 times a day. So at pooping once a week, just Imagine how much waste you need to evacuate.-----WILL NOT Make You "Run For The Toilet" it's just not like that. You can start my system at any time without the fear of being "Stuck having to go real BAD". You will however notice that when you do go you will see a lot more of it. The first time I cleansed, I fasted for 3 days, and still was in the bathroom 2 times a day. Cleansing is an essential part of health, you won’t to be able to do without once you are in the know. The Colon Plaque and Toxins in our system will make the Best of us Sluggish, Prone to Sickness and Just feel like Crap. (cause were all full of it... LOL) The USA today reported on January 11th 1999 "Most people who eat the Standard American Goo and Glue Diets have 5-10 pounds of matter stored in the Colon "The Colon is complex with many Turns and Nooks, and Crannies. Harmful Parasites and Bacteria that live on our waste. Our Synergistic or Psyllium + Flax + Other Powerful Herbs work to cleanse and break down the Toxic Matter is Absorbs. I Guarantee you, try my Formula, Care Kleen (CareKleen Colon and Intestinal Cleanse) you will feel like a different person.